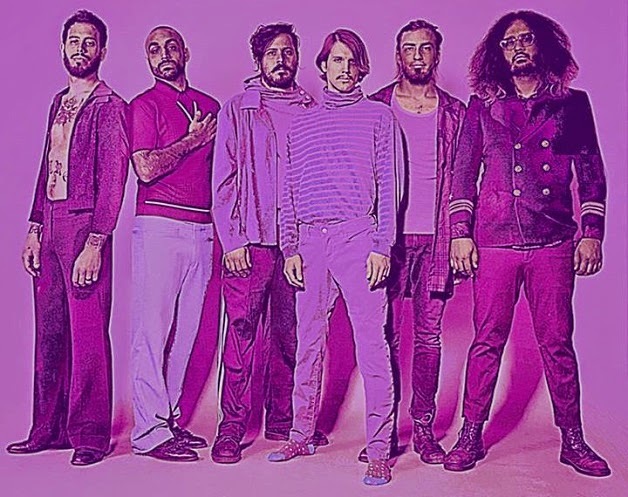 On May 27th, Foxy Shazam will launch a massive summer tour in support of their fifth (and totally awesome and totally free) album, Gonzo. But first, singer Eric Nally was nice enough to drop by and talk to us about the tour, the album, recording with Steve Albini, balancing his career with fatherhood, and Twisted Sister. You're going to be launching your summer-long Gonzo tour next week in Harrisburg, Pennsylvania. What can fans expect from the upcoming shows? Well, we're definitely challenging ourselves as a band with this tour. We're taking ourselves to a new place musically and physically and everything. We're going to bring an all-new show. We're going to play Gonzo in its entirety first. We're going to play about a half an hour, the whole record, front to back in sequence. We're going to take a break, go offstage, come back on and play the older songs that we have. Larry And His Flask will be opening on the first leg of the tour. What led you to choose them? I've always been extremely particular with a live band. I don't come across very many bands, even if I like their music, where I'm watching them live and I'm saying, "Wow, this is really entertaining." Where on top of liking the music, I'm being visually entertained. I don't see that very often. Even the bands that I go see that I really like sometime bore me when I'm watching them. I'd rather just be at home in my comfort zone listening to their record. But with Larry And His Flask, that's not the case at all. Their show has always impressed me and we toured with them on the Warped Tour and that's where we met them. I remember thinking how fun they were to watch, on top of them being great music. Foxy's somebody who takes the show very seriously and we wanted to take it to the next level for our fans and I think Larry And His Flask's a band that does that. Putting a package together like this is basically just trying to give people a great ticket. Let's talk about Gonzo. I love the album, especially "In This Life" and "Don't Give In." You dropped the album with very little fanfare. There were hints on your Facebook page that new music was coming, but that was about it. Why did you just basically say, "Here's Gonzo. Enjoy it. You can have it for free." I wanted to break down the wall between our band and our fans and new fans and anybody who can access the music. I wanted it to be as easy as possible for people to find Foxy Shazam and to listen to them and hear what we're doing and what we stand for. I feel like Gonzo is the record that best defines Foxy Shazam so far in our career. For us to give it away for free and make it available so easily for people, it was important to me because it's really what we are and I want people to be able to access that easily without having to save money or talk their parents into buying it. Any obstacle you could possibly come across, I didn't want that to be in the way. And at the same time it lets people know we're not in this for money. I want to make a career, I have to because I've got to support my family, but the core of this whole thing isn't because of that. It's not because of money. It's because I love to play music and I want to spread my music to everybody. What drew you to Steve Albini? Was it one album he worked on in particular or his entire body of work? I liked his attitude towards the artist. In this business, it's hard to believe but there's very little respect towards someone who's an actual artist. That part of it has been kind of lost. In the industry, it's not about the art, it's more about the business. With Steve, reading his interviews, it seemed like he was someone who really supported the art of something and he just lets you do your thing. And he did I'm assuming? Oh yeah. He just did his thing which is record our album. We just brought it to him. We got everything ready. We produced it ourselves. The album was done before we even stepped foot in the studio. When we got there, we just literally played the album straight through and he recorded it. I just think he's really good at doing that. He's good at capturing what you're good at. Yeah, I wanted to ask you about that. You recorded the album live, in order, all in the same room, and during Halloween. Was there any particular reason? When we were writing the record in our practice room, we would always say to ourselves, "With computers nowadays, you can add as much as you want after the fact." Your songs are done and then you can go back in and add anything you can possibly think of. Even if you don't play it, you just add it. For us, I wanted it to be the meat and potatoes. I wanted people to hear the power of our music in its purest form, in its most minimal form, but it would still exceed the bigness of any record that we made in the past. We would say, "This is how it's going to sound. We're not going to add anything. This is it. What we're hearing now is how it's going to be, so let's perfect this. Let's make this as strong as it can possibly be." And that's the reasoning we did it all live because it sounded the way we wanted it to in that state. You mentioned that the music is a bit toned down this time around. Was this done intentionally to give the lyrics, which are great and more heartfelt than your previous albums, the chance to have the main focus? Yeah. I kind of wanted to tell a story a little bit and hone in and focus a little bit. For me, it's weird when I think of Gonzo being toned down because I had to take it up so many notches to get that out of myself. I think musically, it does come across as a little bit of a softer record but I think content wise, there's definitely more energy and more force than I've every applied before. Yeah, I was mainly talking about the layers of music and the lack of big background vocals and all that. This record, I'm not hiding at all. There's no part of Foxy Shazam--and I'm speaking for myself and everybody in the band--nobody's hiding behind anything. What you see is what you get. When you spoke with USA Today about your new video for "Tragic Thrill," you said "I have to fight hard to preserve that sense of reality so as to bring up my children." I loved that. How do you balance being a musician and touring and success with being a father? It's pretty hard because there's places I've gone in my head mentally that my kids haven't been yet. When I go to these places, I'm excavating and I'm writing about it. I'm basically mapping parts of my brain and parts of the things that I figure out as I get older. I write about that and some of that is heavy stuff. Sometimes I feel scared to just put that all out there and let my kids hear it. This album has a lot of emotional issues that I dealt with my father. It's not just my kids, it's every kid that hears the record. I just want to go these places in my head and document what I find there, but I don't want people to think that they have to go there themselves. That's a scary part about being a father and being an artist because sometimes it's not always happy, it's not always good. But the fact that I'm able to get it out in an art form and not in some other destructive way, that's what I try to get my kids to focus on. It's hard balancing that. That was a quote from Marlon Brando that I took. He's a way different artist than me but I feel he was talking about the same things. I feel very connected to what he said there. I feel you have to get certain things out of yourself as an artist but at the same time you got to be considerate how people might perceive that if they don't understand where you're coming from. Oh wow. Gosh. That's a hard one. I'm gonna go with Van Morrison. He would be the headliner. Paramore, just to put a little relevance in there. Queens Of The Stone Age would be cool to put on there because I love a lot of their records. Do you remember this band called OMC? They sang that song like "How bizarre, how bizarre. Da-na-na-na." They're a New Zealand band. The singer, Polly, he died a long time ago but they're a great band and I've been into them lately. I'd have OMC. I think Richard Pryor would open the night and just put a little funniness there. What song do you all perform as the finale? "Unstoppable" because we'll never stop. We actually asked the music festival question to Dee Snider and he picked Foxy Shazam as one of the five acts to appear on the bill with Twisted Sister. Okay, okay. I would invite Dee just to hang out and he'd just have the night off and he could relax and have fun.